Click here for squirrel info. This is a two entry two porch house it is the same as the deluxe house but has a secont entry hole and a second porch. This is a two entry two porch house with slight cosmetic flaws, it is new. 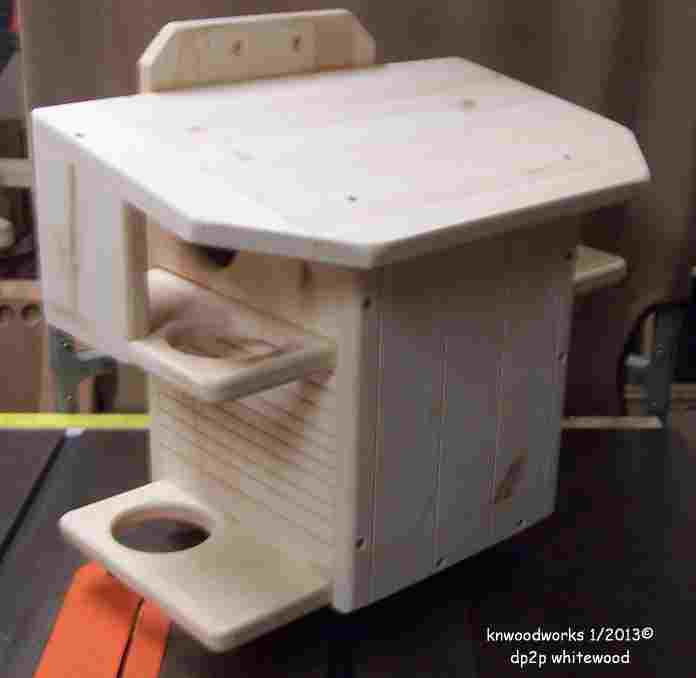 This is a pine/whitewood single entry squirrel house with predator gaurd, it has a side cleanout door and drainage holes in the floor, this is a single room house. 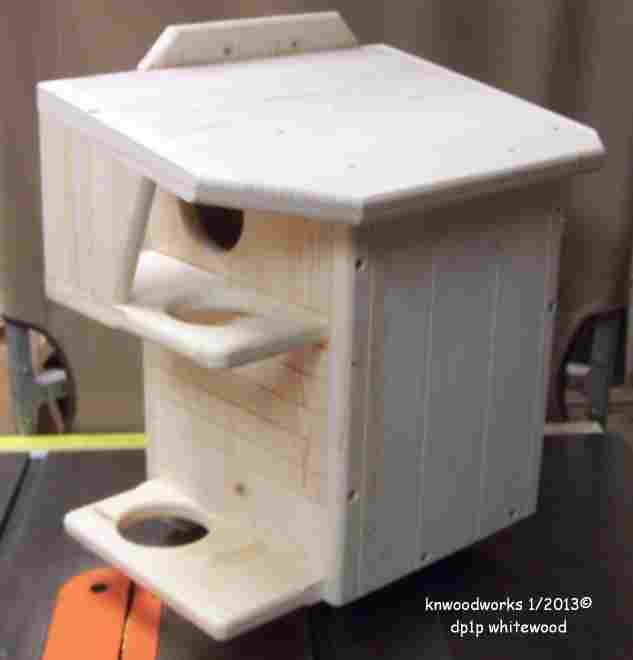 This is a 2 entry 2 porch whitewood squirrel house, it has 2 entry holes 3" and 3 porches total, side cleanout door, mounting holes top and bottom of house. This item is a 1 room house. 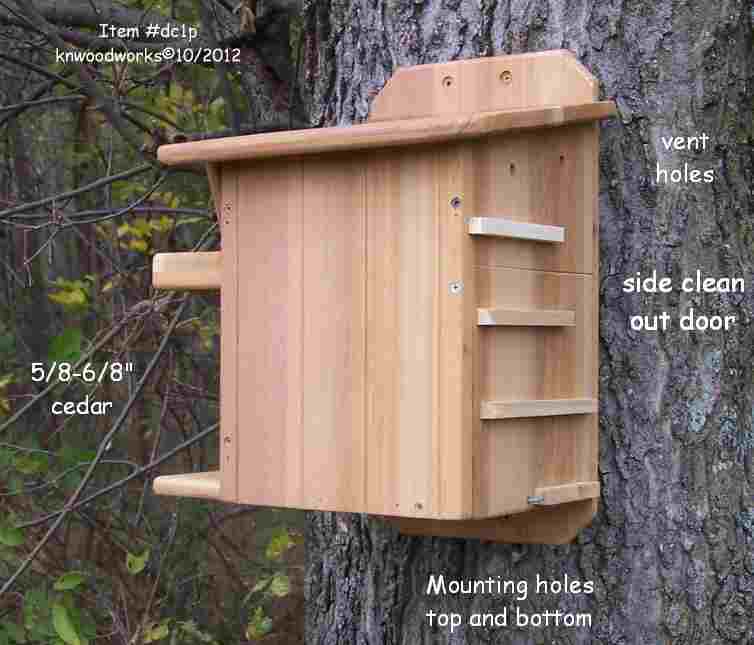 This is the classic pine squirrel house, same as cedar house above but made out of pine instead. Same as classic cedar house but with front plexiglass window, item has porch and predator guard, it has a window on the front that is made out of this plexiglass otherwise identical to classic cedar with porch and guard. The window is removable by simply removing phillips screw. Item is build to order 3 to 10 day turnaround. This is a classic cedar squirrel condominium it has 2 rooms instead of one, item is the same as the classic cedar house but is larger with a top and bottom floor, it is made out of cedar and has a clean out door on the side (lower floor only), the porches are 4.5 inches deep 1/2" deeper than the standard house, the entry and floor hole is 3" and the item is 23 inches tall and the roof is 15" wide. The fasteners on this item are brads, exterior screws and is glued together with water proof glue for strength. 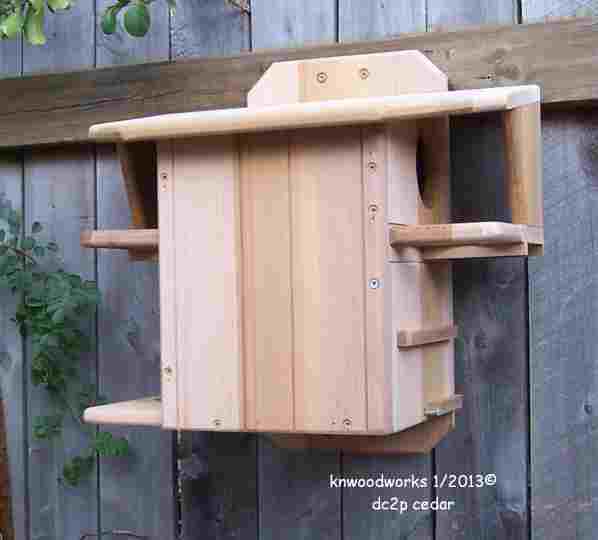 This is a classic cedar squirrel 2 entry condominium with window. It is made out of cedar and has a entry on both sides of the house and porches on both sides. The item has drainage holes in floor and a side clean out door on the bottom floor, there is access to the top floor by removing the window which is held in place with a phillips screw. 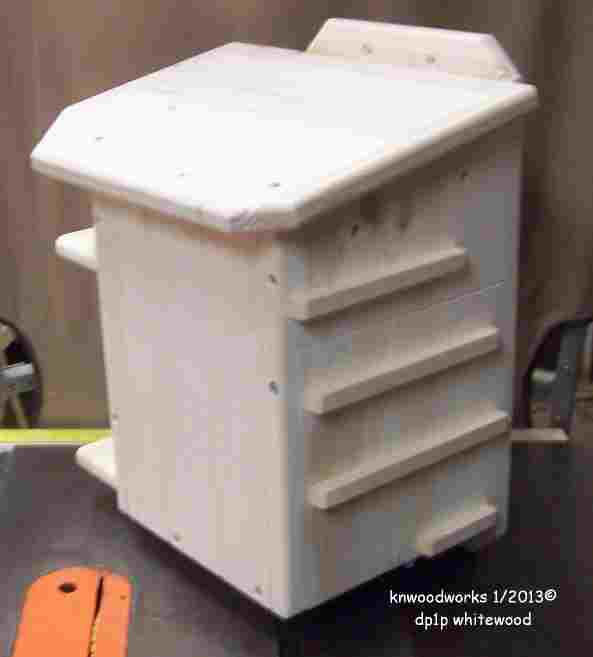 It is glued together with waterproof glue and fastened with exterior grade screws. This item is 24" tall and the roof is 18" wide the unit is about 10 1/2" square. 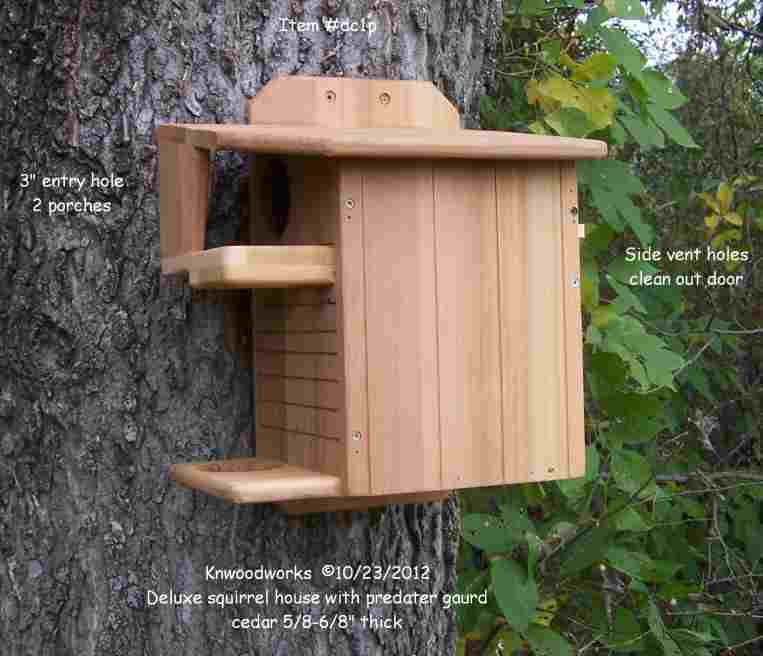 This item is build to order about 10 day turnaround, great item there is not another squirrel house like it. 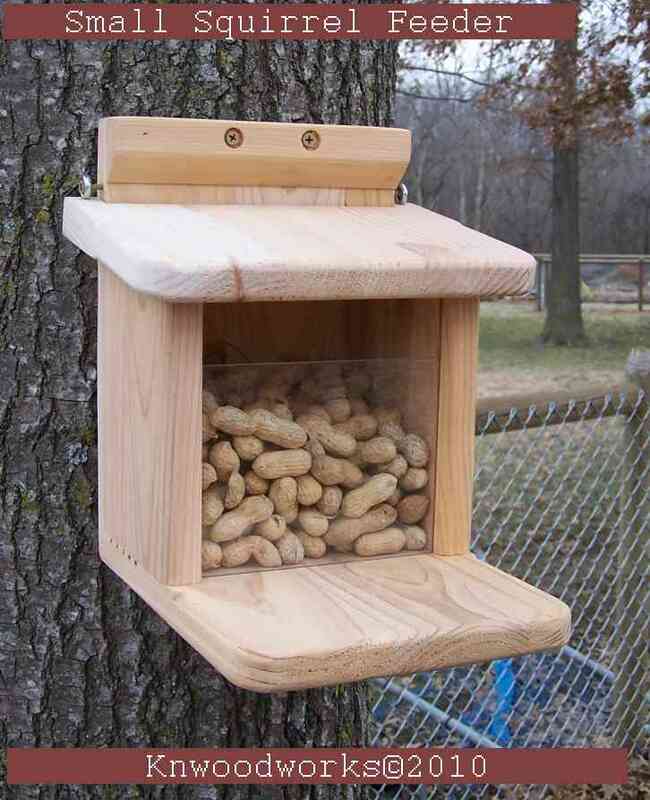 This is a squirrel feeder with a lift up roof and a plexiglass window, simply fill with squirrels favorite food and watch them reach in top of window and eat. Window is removable for easy cleaning,Item is made of 3/4 inch cedar. Roof lifts up for easy filling and window is removable for easy cleaning. 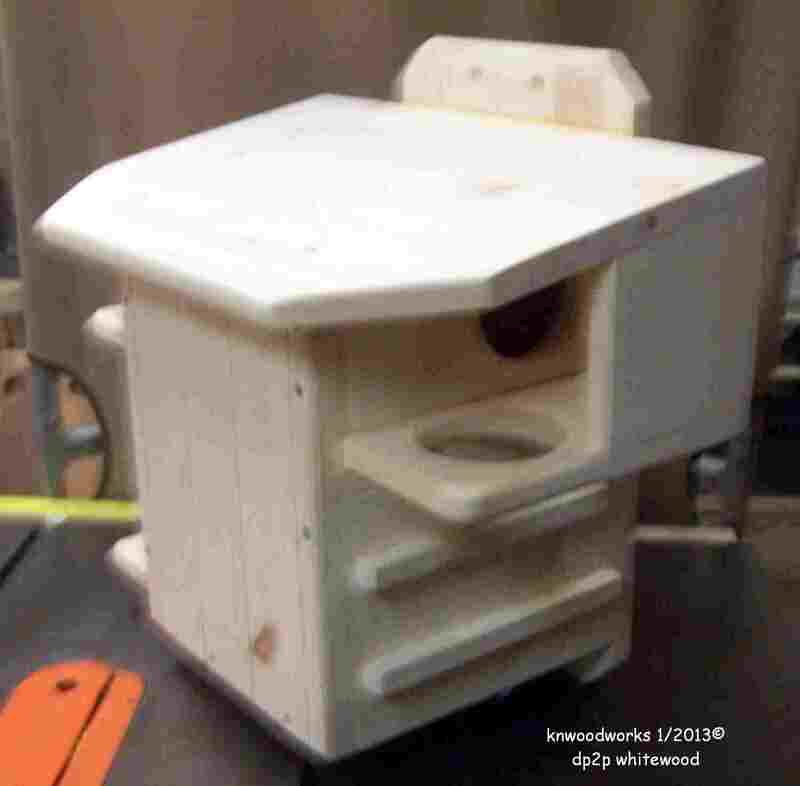 This is a deluxe squirrel feeder, it has a slide out floor for easy cleaning and a cookie jar style top for easy filling, there are two 3 3/4" holes at each end for the squirrels to enter and exit. This item is made out of 3/4" cedar and uses durable exterior grade plexiglass for windows front and back. Item is easily mounted using screws or wire thru back plate or can be set on table or wall. *Note - Raw peanuts are not suitable for squirrels rather use roasted peanuts or there favorite food hazelnuts with the shells which are more nutritious. SHIPPING - Items are shipped Fedex ground or ups ground, shipping time is about 3-5 days, free shipping insurance and tracking number. We ship Monday thru Friday. PAYMENT - We accept debit or credit card or money orders. Common Tree Squirrels in USA include the Western Gray squirrel,American Red Squirrel, Eastern grey squirrel and the fox squirrel. Squirrel nests are called a "drey"
Squirrel colors - Gray squirrels come in several colors ranging from shades of gray to shades of brown, gray squirrels can also be all white to pure black. Red squirrels can also have a all black coat. Tree squirrels do not hibernate, they are active year round except in severe cold or storms when they may stay in there nests for days. The average adult squirrel needs to eat about a pound of food a week to maintain an active life. A squirrels teeth grow continuously. Their incisor's will grow six inches per year, they must constantly use them to keep them short thus the constant chewing on things such as branches and occasional power lines. Squirrels can be trained to be hand fed, it is not recommended though because of there sharp teeth. If you do choose to hand feed never hold the food between your fingers. Squirrels use there tails primarily for balance they also use them as a blanket when they sleep and to communicate with other squirrels.